Queens of Geek is filled with supportive advice for teens struggling with identity, mental health, relationships, sexuality, and body image. It’s a modern story about love at the intersection of a whole host of different identities we have as layers of ourselves. 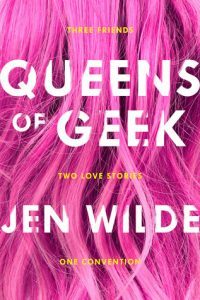 Queens of Geek shows that stories for teens can be love stories with depth, and all the better for having diverse characters. Queens of Geek is a straightforward story about 3 best friends from Melbourne who make the long trip to a fan convention in the US during their final year of high school. Charlie is a Youtube star, Taylor a Tumblr fandom queen, and Jamie is Taylor’s long time crush. The story is told from both Charlie and Taylor’s perspectives and Jamie does get a little lost. There is a nice balance between Charlie’s tentative flirtation with her long time, long distance crush Alyssa, Charlie and Taylor’s unbreakable bond of friendship and Taylor and Jamie’s friends to more than friends storylines. The narrative does occasionally veer into the kind of inspirational rants only found on Tumblr, but having the messages spelt out so clearly leaves no room for misinterpretation of the author’s views about a whole host of issues. Charlie gets all the best rants, taking on bullies, misogynistic ex-boyfriends and overzealous fans. As unrealistic as they were I couldn’t help cheering along with her. Queens of Geek is unashamedly nerdy. The fandom culture of Youtube, Tumblr and the way it spills over into conventions is written with tenderness that can only come from someone who has experienced and loved that scene. The intense bonds formed in signing queues, the overwhelming sights and sounds, the intensity of finally meeting a hero, all are so vividly and lovingly described. I really enjoyed reading Queens of Geek, it was a short, delightful and uplifting story about love and friendship. The writing was immature at times, strayed into cheesy descriptions and stilted dialogue more than once, and there was little differentiation in voice between Taylor and Charlie’s chapters. Despite this it was a pleasure to get lost in a book which effortlessly integrated so many different perspective and treated fandoms and the fans who fuel them with such fondness.